Vacation rental house. 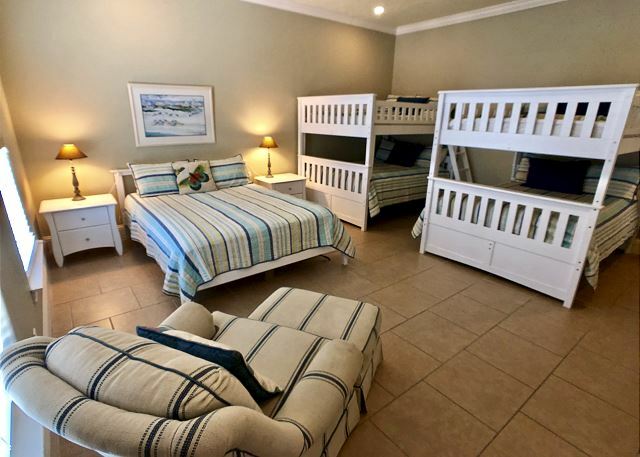 Sleeps 32, 5 bedrooms, 5 bathrooms. Dogs allowed. Near Roll Over and 17.4 Miles from Ferry. This enormous, traditionally styled beachfront vacation home in Caplen Beach is perfect for your large family gathering! 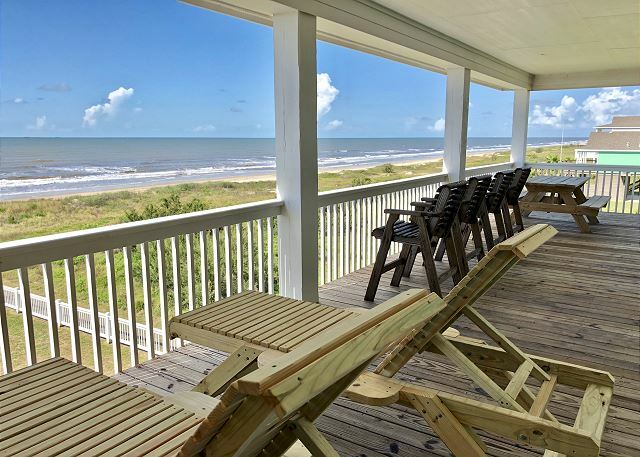 The open living/dining/kitchen area on the first level of this home features a wall of windows showcasing the expansive view of the Gulf of Mexico. 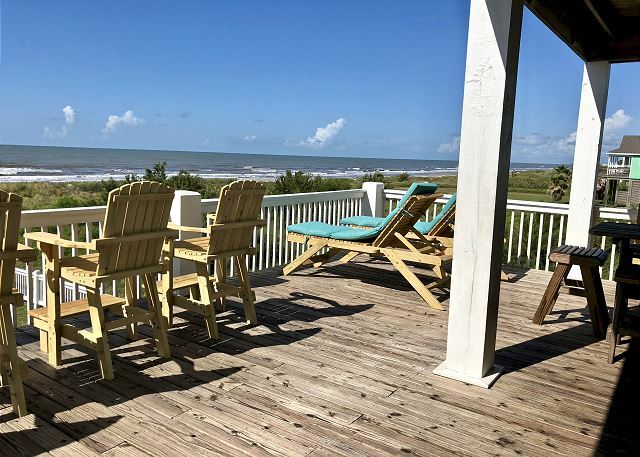 If wonderful vacation memories are what you are looking for, then this Caplen vacation rental is a great choice. There are very spacious and comfortable seating areas and the tile and laminate floors throughout keep this area cool and relaxing. With large dining table, kitchen bar, and cocktail table, there is more than enough room for your guests for dining and entertaining! 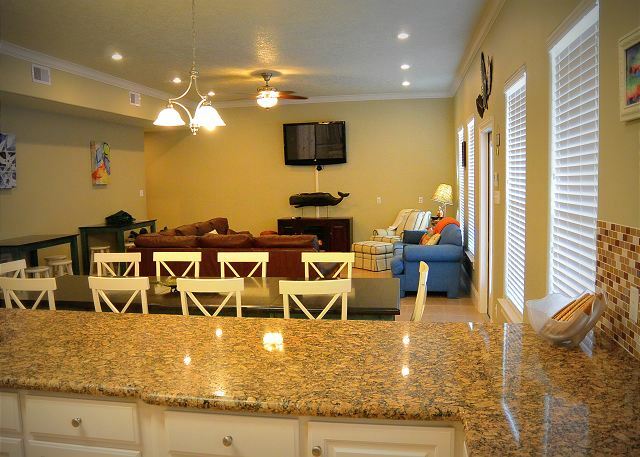 Complete with 5 bedrooms and 5 bathrooms, accommodating everyone in your group should be a piece of cake! When you can no longer resist the call of the sun you can step out onto one of the two levels of deck - or enjoy the shade of the covered sections while watching the kids on the beach. When you're ready to get some sand between your toes, you're only steps from the beach! Nearest beach access road is Rollover Pass. 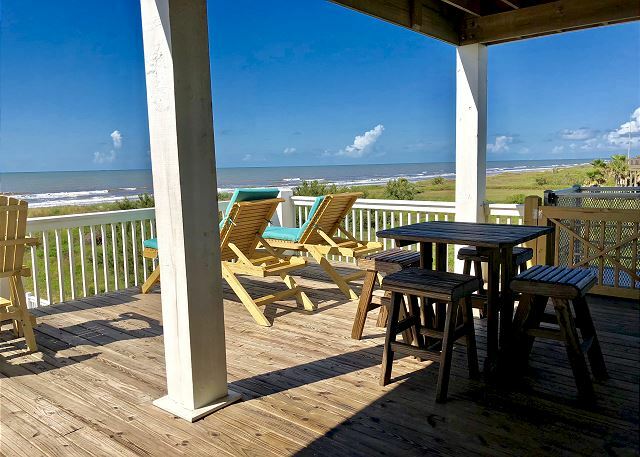 This home works well with LOVE SHACK, COOL BREEZE and SANDY BOTTOMS. We rented the Moby Deck for a family gathering during the Christmas holidays. Everyone had a fabulous time - the gameroom was a big hit! The house was very spacious and clean and the bedroom setup just perfect for our crowd. Would definitely rent again. The Moby Deck was wonderful for our family vacation! We are still talking about the wonderful location and great times at the beach! 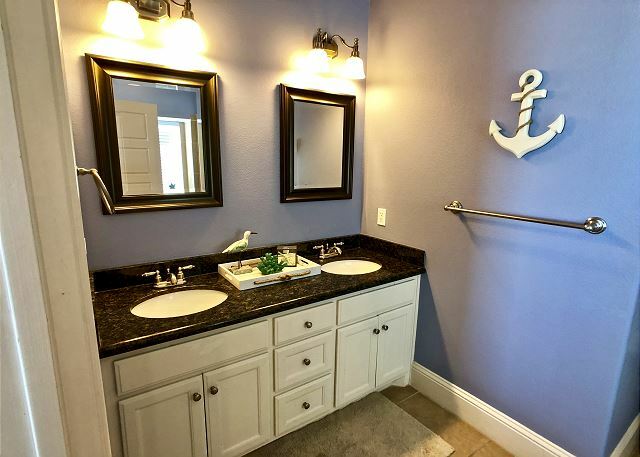 The home had everything that we needed, had plenty of room and greatly met our expectations. We are planning on returning again very soon!! The home and location was terrific. Perfect for our group . 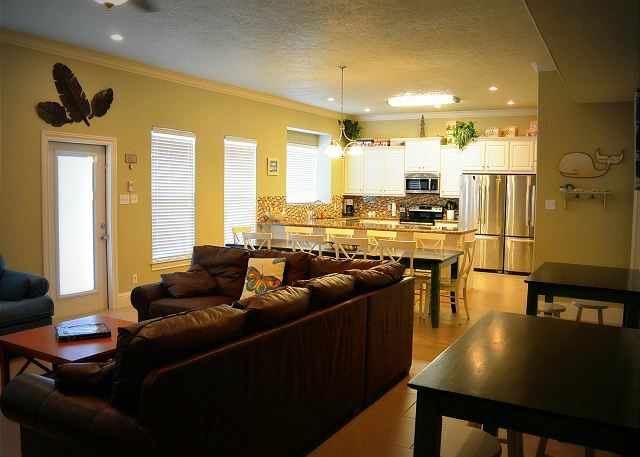 I had never rented in Crystal Beach before - or with Cobb . I wish I would of known that we would have to make the beds and pass out all the towels- but it was fine. Also need to tell guests that TP is not provided. Might be common- I just didn’t know. I might of missed that in the rental agreement. We had a marvelous time. Besides the house being terrific so were the people of Bolivar! The home was fantastic, the view beautiful and was overall a wonderful family experience. this place is very beautiful, the property and the staff was excellent, my family, friends and I enjoyed the place to the fullest, thank you very much, congratulations for everything! House was ready upon arrival. Staff was excellent as always. Our family loved the house, amenities like the pool table, ping pong table ,tv's in every room and space. What a wonderful gift to share with family and friends during this holiday season. 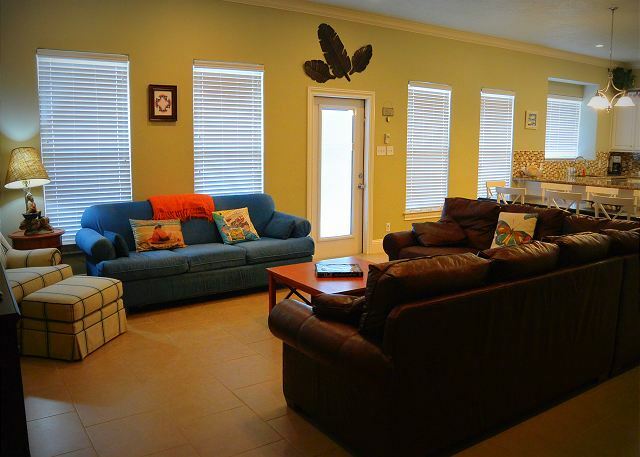 Great relaxing family vacation home. Hosted our annual men’s hunting/fishing retreat. Plenty of beds and TVs for each of the rooms. Ideal for large group whether family or girls or boys weekends. Close to Rollover to wet your line and catch fish or blue crabs. Access to the beach was great as well as the ground level patio which provided shaded hang out area. Parking was adequate for even large group. Direct TV never went out which was great for college football viewing (problem at other rentals in the area).Kitchen and smoker pit helped keep all fed. 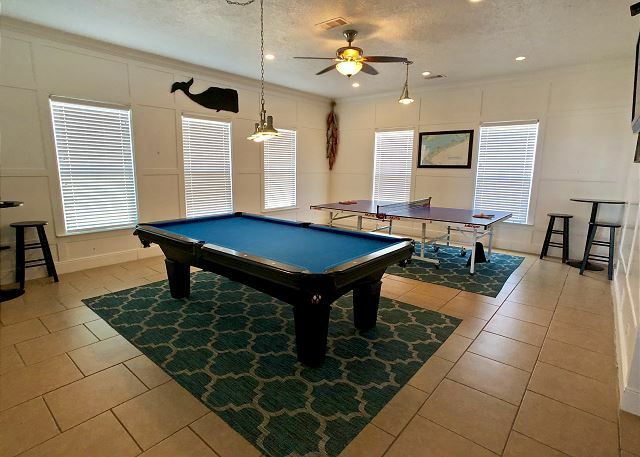 Fantastic rental experience for our family and friends-- can host many people in such a large house and with a pool table and ping pong table there's plenty to do even when it's pouring rain! Would definitely rent again. Very nice on the inside, seemed to have some Harvey scars on the outside (which is understandable given how soon after it we rented... they didn't impact our stay!). We had a great time. Will come back next year. What a great home. It's so family friendly. 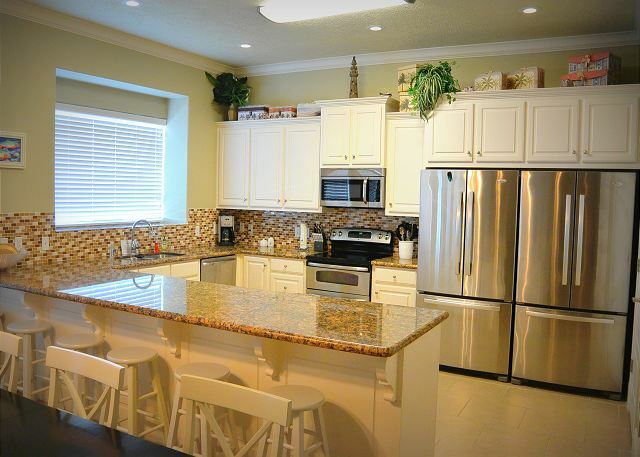 The kitchen is.a dream and so spacious. My large family had so much room to spread out and everyone had a bed. The views were stunning. Coffee in the mornings on the deck was heaven. The ping pong and pool tables were never idle. Very clean and updated. Fully stocked kitchen and washer and dryer. Great views from to deck also. I highly recommend the Moby Deck. North meets the south party!!! 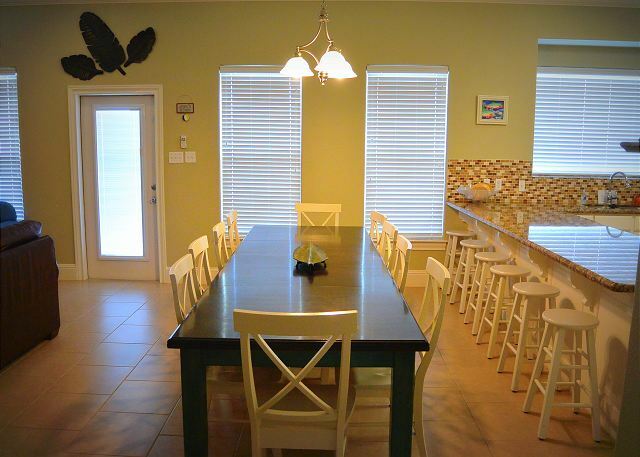 We rented this home for our newly combined families to meet and have a great time on the beach and we did!! We came in on Wednesday and everything was in the house as promised. It was quite clean. We had quite a few people throughout the weekend and had plenty of room for any and all that wanted to stay for the night. The stairs are a lot but that's to be expected and you could always stay down stairs on the concrete in the shade!!! The beach was nice, narrow, but very nice the grandkids (and kids) had a blast!!! One drawback is there is not a gate on the fence on the beach side and with having a 2 year old that was hard to keep him in. The kitchen is very nice size for everyone being in the kitchen at the same time. Great dining table to sit everyone, if you're not eating outside on the picnic tables and bar tables. When we went to check out no one was in the office so we left the key. Don't like doing that but because of airplane restrictions we had no choice. All around it's a great place!! Great experience. Property was clean and maintained with few exceptions. Location was fantastic for beach access. Plenty of space for 30+ guest. Extraordinary! I have recommended you to everyone. Place was amazing. Plenty of room and pictures were accurate on description. Very close to beach and management was very accommodating. Only downfall of our trip was a high tide prevented minimum beach time, but that had nothing to do with the property. Definitely would stay here again. We used this house for our daughters wedding and everything was perfect! We had a wonderful time at the house at our mother daughter retreat. The rooms were very nice and clean. We will book there again. A very large, modern and clean house, perfect for large groups. 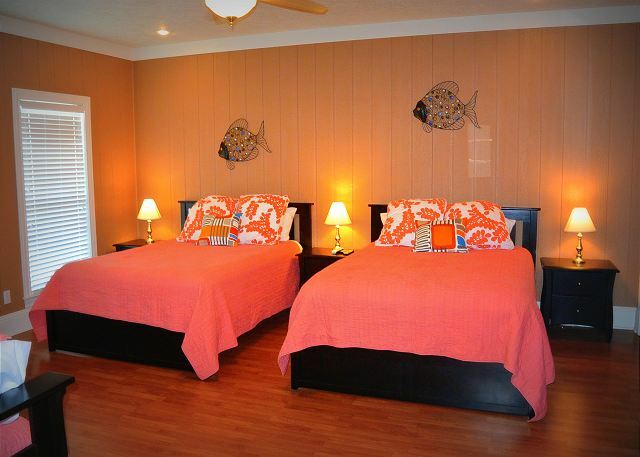 We had 3 adult couples and 5 kids ranging from 18 months to 10 years, and had room to spare. 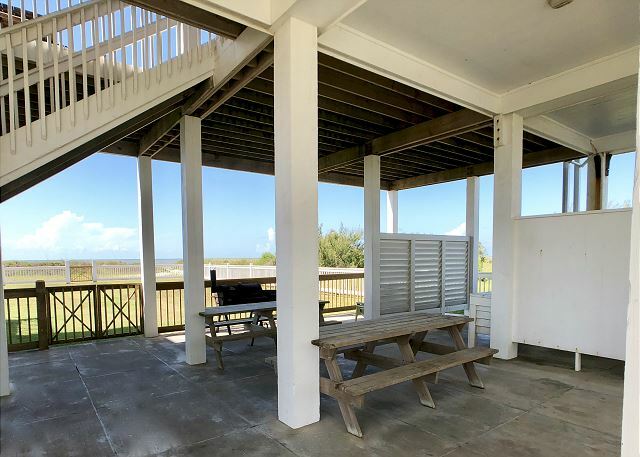 The direct beach access was great; the pool table and ping-pong table were a big hit with the kids; and Rollover Pass was within walking distance (for all you anglers). Recommended: mosquito repellent and a golf cart rental. Our stay at among Deck was great! Million dollar view of the Gulf. Big, roomy home that will sleep 32. Everyone on Crystal Beach were extremely friendly. Ferry trips to Galveston were very scenic. We even got to see Dolphins! 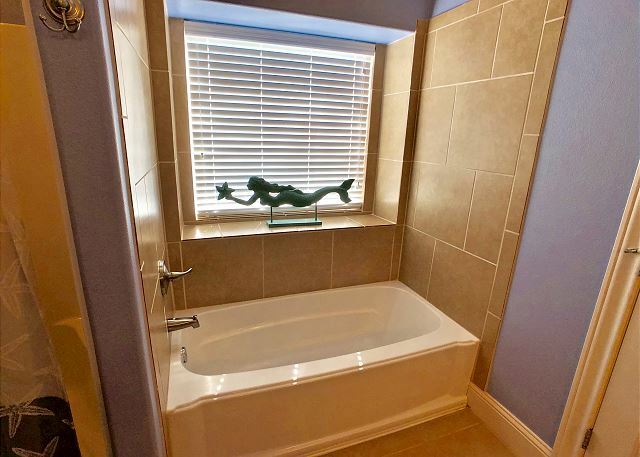 We would recommend this home to anyone! I have a huge family and we do a beach trip every year. Its always a trial and error to find a cabin to accommodate the 37 of us. This cabin is the answer for us! Very spacious so there's plenty of room for everyone to do their own thing and not be on top of one another. Its very modern and super clean. The only thing I would change is adding a door from the game room to the living area to cut down on the noise when the pool table and ping pong table are being used. Other than that is truly is PERFECT!! The rental had everything you needed. Gorgeous house right on the beach, with a yard to play games or volleyball too. Definitely great for our family get together. Only downside we had was that there were gnats all around, most likely because of the septic tank. Wonderful place for a family reunion! We gathered for Thanksgiving, all 25 of us! Had a wonderful time. Game room, beach, and plenty of room for all. Outstanding start to finish. The rental app was handy and easy to use. The property was excellent. Furnishings were clean. Staff was friendly. Not hard at all. We had been there with the another group before and we knew exactly what we wanted. The cabin was very spacious, had all the amenities we needed and was very nice. It is located in a great spot, the surf fishing was excellent! WE ENJOY THIS CABIN SO MUCH. THERE IS 26 OF US AND THERE IS PLENTY OF ROOM AND THE KITCHEN IS GREAT! KIDS PLAY VOLLEYBALL IN THE YARD, COOK UNDERNEATH AND FISH AT ROLLOVER. OVERALL IT IS A GREAT VACATION. Our fishing club had a splendid time and plan to come again next year. There were 30 of us. We had a wonderful Thanksgiving with our extended family. Moby Deck is perfect for large groups. Lots of beds and lots of seating, well equipped . The game room was wonderful and the yard had lots of room for lawn games. We really enjoyed our stay. Our only problem was that the Internet did not work the entire stay. This is a beautiful beach home. It is in the perfect location to relax or fish! The stay was awesome. No complaints. The staff was more than helpful. We had our wedding of about 120 ppl on the property. Parking was not an issue. The area was secluded so we had our privacy plus our weddinf guests had direct access to the scenic beach. If u are planning a wedding or get together...this is the best way to go...halls cost about 2000 for a few hours...we got this place for 3 days. We had more than enough room gor everything. We want to rent this again. Thank cobb real estate for making my dream wedding a reality! We had a great weekend and the rental was easy. The people answered all my questions. I organized a weekend for 27 people and it went very smoothly. The weather was beautiful the house was beautiful and we'll equipped. It couldn't have gone better except that the WiFi password we received didn't work, but we were having such fun that we ended up not really using it all that much. I would definitely stay there again. It had a great amount of space and the beach is right out the back yard which is also huge. Absolutely wonderful. Amazing. The house was beautiful and the wedding was like a dream. All of our guests had a great time and can't stop talking about how beautiful the ceremony was. I'm forever grateful to Cobb for personalizing my property search and we'll be renting this home again. Thank you! This was our second time to stay at Moby Deck and we really enjoyed the new deck furniture. Being right on the beach was perfect for our group of 28 ladies to get away, relax and refresh. THIS HOUSE WAS WONDERFUL. THIS WAS THE BEST DESIGNED HOUSE WE HAVE EVER STAYED IN. WE HAVE BEEN GOING TO THE BEACH FOR 24 YEARS AND AS OUR FAMILY HAS GROWN WE HAVE CHANGED HOUSES. WE ARE NOW ABOUT 30 PEOPLE AND THIS IS AMAZING. THANKS TO THE OWNERS OF MOBY DECK FOR SHARING WITH US. 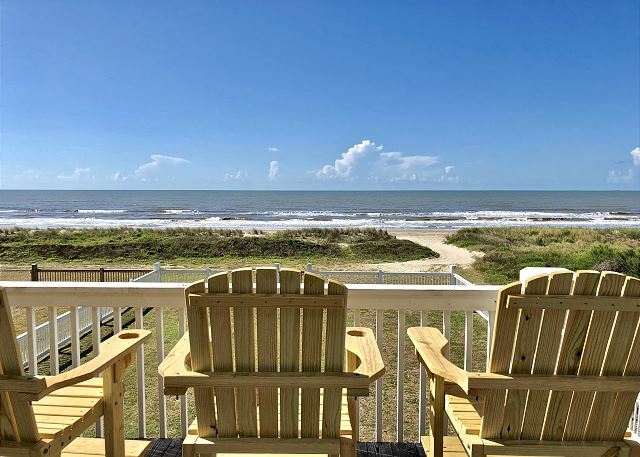 Our very large family takes a trip to Bolivar Peninsula every year religiously for the past 15 years. We always struggled to find a house that we loved and had the accommodations we needed. Well...WE FINALLY FOUND THE ONE. This house was amazing!! 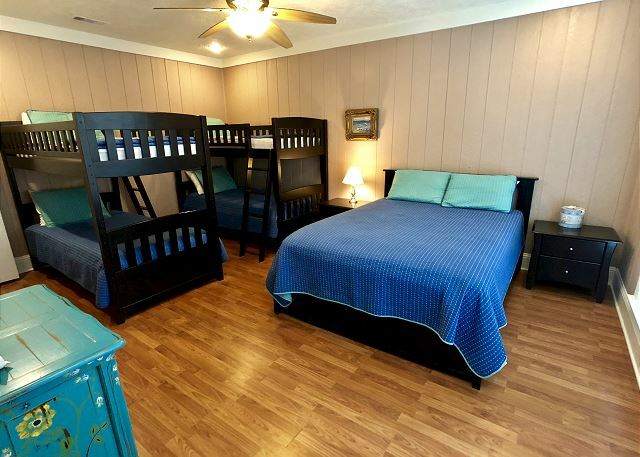 We all felt comfortable with plenty of room for the kids...they spent most of their time in the game room or up on the 2nd floor deck, when we weren't at the beach. Which was also amazing because we walked out our front door and were literally on the beach. The surf fishing was super great too!! The house overall was very clean, and very accommodating. It had plenty of dishes and cookware for our large family. A big pantry and two refrigerators were a bonus too!! We will definitley be booking again for next year. Our family of 15 stayed at Moby Deck for 4 days on Mothers Day weekend. The house is great and the game room was outstanding! The gulf was having a sea weed "bloom" so several of us preferred not to swim. The game room provided plenty of activity and fun. 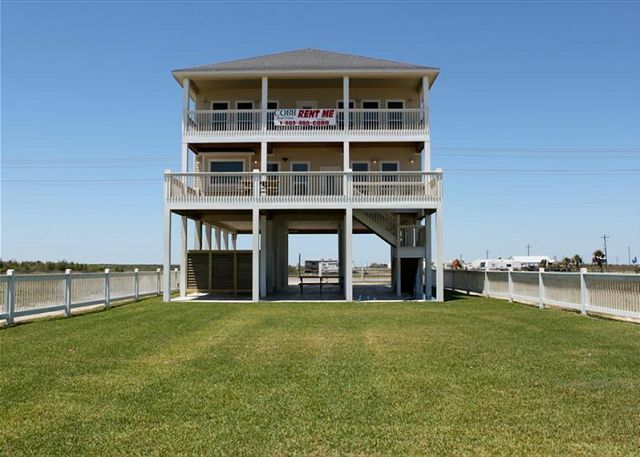 The house is located close enough to the "Big Store" and the rest of Crystal Beach to be very convenient. We enjoyed the Crab Festival that weekend, as well. We loved the secluded location of this Beach Home. The beach was very clean and the water was perfect. Inside the home each bedroom had it's own separate bath which made the experience even better! We would rent again! Moby Deck is spacious, comfortable and fun to spend time at. Provide more room in the driveway entrance for multiple cars with boats to enter and exit. When you have two boats or more, its way too difficult to manage with the small entry space provided. It isn't safe to leave the boats on the side of the road outside the entry, either. We stayed at Moby Deck last year and again this year for weekends. The house is great and well designed and perfect for our high school alumni class. It is beautiful, modern well equipped and the kitchen is supplied with an amble amount of dishes and cooking utensils. The only improvements we would recommend is for all the TVs to have satellite/cable access; and a router for internet access. The queen bedspread in the blue room had some spots, however all the other bedding and pillows were fine. My sister is looking at your beach houses for a summer rental next year. Your staff is great, very courteous, profession and accommodating. Thanks for two great visits. It was an overall awesome cabin. We will definitely consider renting again. It was an overall good location and even on the weekend the beach isn't packed in that area. There was way plenty enough room for everyone without getting in each others way and the gameroom was an awesome plus! The house was great, room enough for everyone. Kitchen was perfect with two huge refrigerators, Cabinets and drawers were stocked with everything for cooking and dining. The only thing I would add would be an ice maker since the house houses so many. The freezer ice makers could not keep up with our demand. The only thing I had a problem with was the dishwasher. The rubber seal around the door would pull off every time you opened it! minor detail but a pain just the same. The location was perfect for us as we prefer no crowds around us!! we are snobs when it comes to vacationing! !Rooms were huge and bathrooms were a good size. Overall inside and out was very clean and well kept. Pool table and Ping Pong were a big hit with kids and adults. We did think ahead and brought our own ping pong paddles and balls. Pool table equipment was satisfactory considering the number of people who might go through the house. We are planning on renting again for next summer! The staff, property,etc. were excellent. Would recommend to all. easily accommodate parents and several children together. Being on the beach is fantastic when you have lots of little ones with lots of stuff to tote. Would go back again and again. Needs more towels in the kitchen otherwise everthing else was great. Definitely will return..
We did a weekend family reunion at Moby Deck, everything was great, plenty of room for everyone the house was very clean & furnished with everything we needed. Nice big kitchen for cooking and serving. 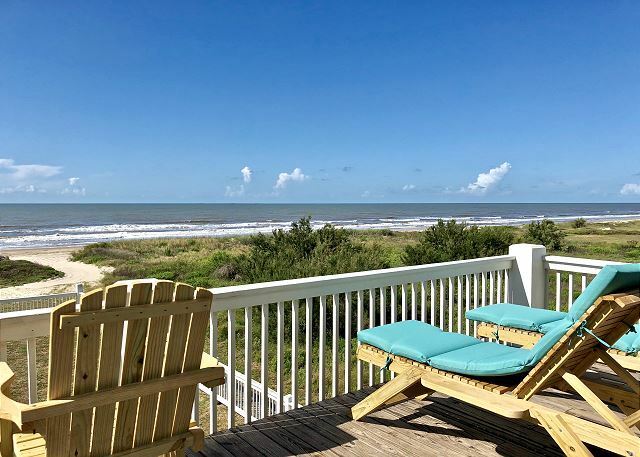 We are very happy we chose Moby Deck it was very easy for everyone to find & it is right on the beach. We look forward to doing this again next year. We had 23 participants and everyone enjoyed it greatly. Moby Deck was perfect for us because it is designed specifically to accommodate large groups like ours. There are only a few small suggestions we would like to make, none of which had any significant effect on the rich quality of the whole experience. - Include detailed instructions on how to use the satellite tv, and how to move between it and the dvd player. We figured this out but the instructions would have helped avoid a lot of trial and error. - We may have not have been doing something right, however, all of the rooms had tis but we could not get all of them to access sattelite programing. Although I personally did not test them all, the ones in the living room and dvd, game room and green room all worked ok. The one in the blue room could play dvds only. It was reported that the one in the 2 queen room did could not. I'm not sure about the King room or downstairs bedroom. It would be a plus if all tis could access satellite. In the green room the shower door bumps the toilet when opened wide. We also noticed water on the floor after showering there. We don't know if it is some kind of leak, or possibly it could be the direction of the shower head pointing towards the bottom of the door. One more consideration, whose practicality has to be weighed, the addition of some kind of lift system that allows the transport of coolers and baggage from the ground floor to the upper floors. For us, who were mostly in our mid sixties, carrying those things up and down all the stairs, required a great deal of exertion. All in all it was truly a five star experience that has us looking forward to doing it again. Our only concern now, is that it proved to be so popular, that Moby Deck may not be able to accomodate all that may want to participate next time. We will worry about that when the time comes consider having a Moby Deck II next door. Great House that is very close to the water. We had a wedding on the beach and our friends and family made some wonderful memories. I highly recommend this home. The Esperience of a Lifetime.. 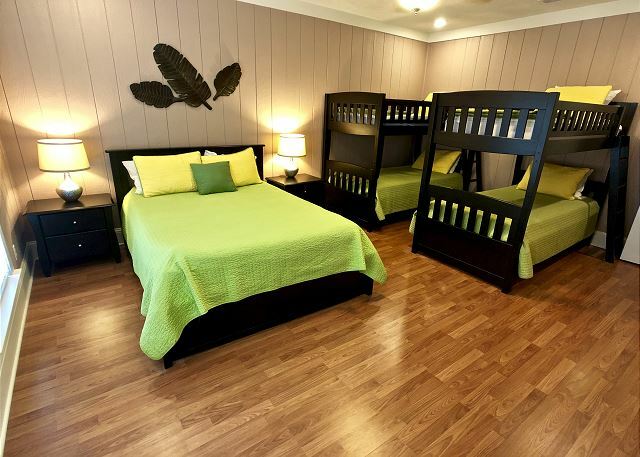 This cabin is situated in a perfect location for several families with kids. Absolutely no traffic on the beach. 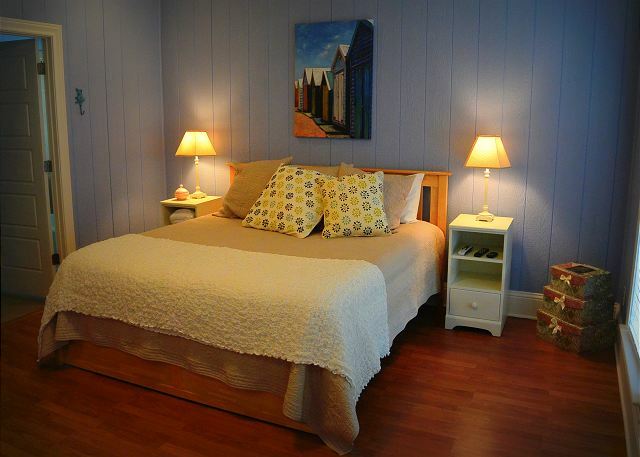 Each family can have their own room with privacy and bathroom. We had a great time. The house was the best we have ever rented in the 16 years we have been staying on the TX Gulf Coast. Everyone enjoyed themselves. We enjoyed our stay, the house was very nice. The only thing that kept if from being the perfect place was the location. The seaweed is not cleaned up at this location. Perfect location to host my daughter's wedding. Lots of room for guests. Thanks so much for all of your help!! Our weekend stay was wonderful. See you all again very soon!! !